Here, they call this time of year Festival Season, but really, based on the number of signs out there today, it should be called Yard Sale Season. As I expected this, I had an entire plan of action. Dropped Beau off at Jackson for his run home at 7am and spent the next 45 minutes in the Marigny Trace neighborhood sale. Then headed straight to the Hosanna Lutheran Church for their annual sale, and then up to Abita Springs for the annual all town sale, which had been partially postponed from last weekend. I suppose, after about 20 or so sales up in Abita, I just got plain tired of yard sales and came home. Beau was shocked ... tired of yard sales !!! And, then there's this whole HUGE box of stuff. I was routing through this box at a sale and was pulling out some pieces of lace and a few stencils and some paints, so asked the woman how much she wanted (thinking it was probably going to be a quarter each or something like that), and she said $2. for the entire box. Great deal, then I could rout through it at home. Well, I did start to go through it at home and it was quite overwhelming, so stuffed it all back into the box (think a box about the size of two photo copy paper boxes), and put it under a table in my studio. 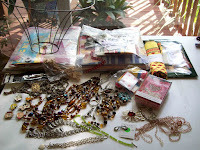 (If I'd just make some table skirts, that box could not be out-of-sight, out-of-mind.